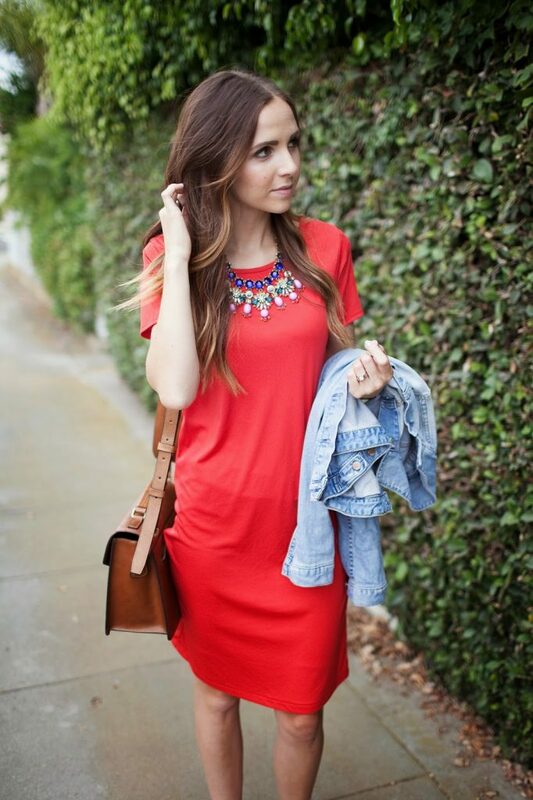 Everyone needs a go-to summer dress. This is mine. 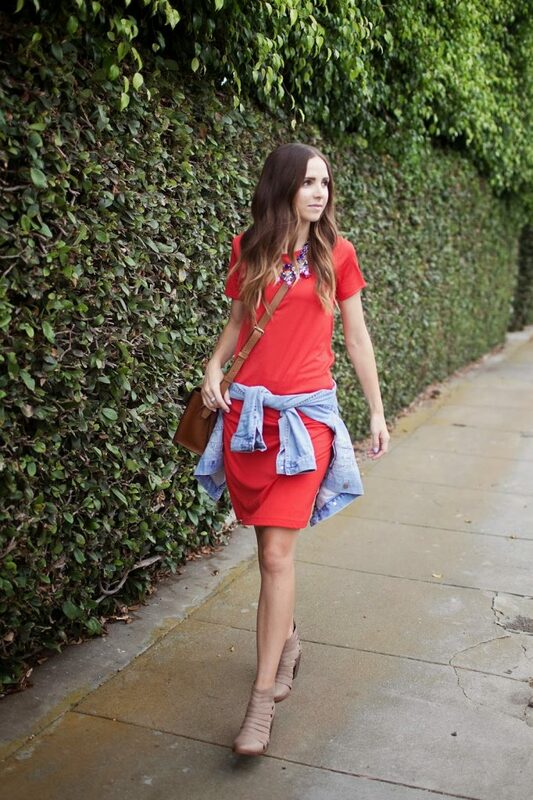 A simple t-shirt dress is easy, comfy, and perfect for dressing up or dressing down. We’re on vacation this week, so I brought it along and plan to wear it with my j.crew chambray baseball cap and sandals, but it’s also so easy to dress up with a pair of booties, a statement necklace, and a jacket like I did here (and wore to church last week). The best part about it is that they’re so easy to make. A few cuts, a couple of seams, and you have a new dress. I love a basic bright color, like the red I chose, but a striped or polka dot or some other print would be amazing as well. The super easy tutorial is at the bottom of this post! 1. Take your fabric and fold both sides in toward the middle so they (almost) touch, as shown. Now both outside edges should be folded edges. First, cut the FRONT of the dress. Use a tank top and a pencil skirt as a pattern, folding them in half and laying them on the folded edge. Cut around them, adding a 1/2″ seam allowance. Repeat for the BACK of the dress, making the neckline a few inches higher. Next, cut out 2 SLEEVES, and a NECKLINE LINING front and back (cut the scoop of the lining exactly as you did the necklines on the FRONT and BACK, but making them 2″ shorter in width so they have to be stretched when attached to the dress). 2. Next, take the FRONT and BACK pieces and, with right sides together, sew them together at the shoulders. 5. Take your two NECKLINE LINING pieces and, with right sides together, sew them together at the ends. They should now form a circle. 7. Sew with a straight wide stitch around the entire neckline, securing the lining in place. 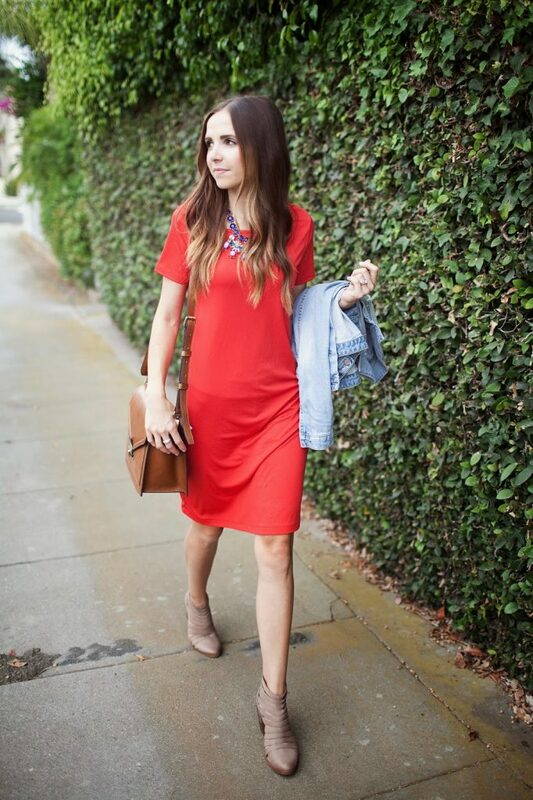 Then try on the dress and determine your desired sleeve and dress length, then hem. And you’re done! 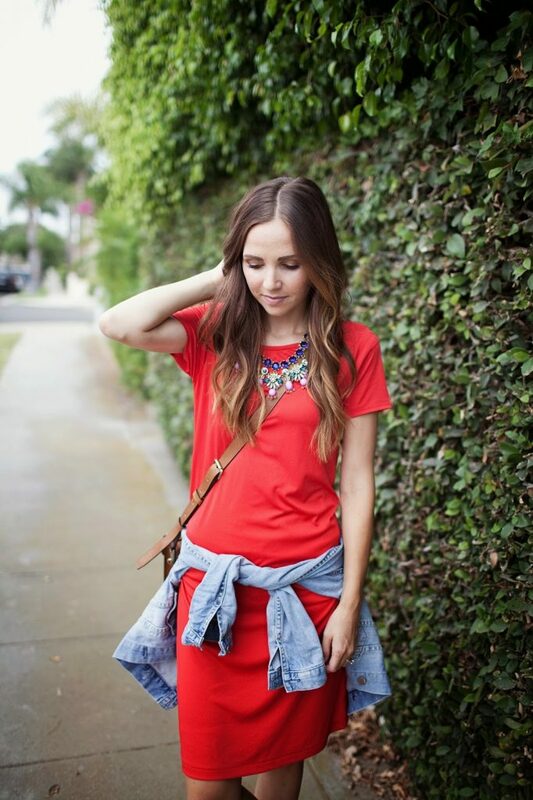 Beautiful statement necklace and fantastic shoes! Would your fabric be cotton interlock? Looks a nice weight and some of the different knits confuse me when ordering online. Yes, it's a cotton-poly blend. It's definitely lightweight, but not see-through. This does it, I need to get a sewing machine! Or maybe I can talk my mom into making this when I go home for a visit this weekend? Fingers crossed she's up for sewing! Love this! Super cool and light for summer! You could wear it to the OC Fair! Are you going? I live in Costa Mesa near you! Ps…you inspire me to learn how to use my sewing machine better! Lol. Casual things always look really good on you. Very chic ! This is super cute but maybe needs a slip underneath? This is super cute and looks relatively easy! But my problem is I'm not a great seamstress and have trouble with the sleeve area! Thanks for all of your tutorials! love this tutorial!! this might be a dumb question, but how do you do your sleeves? do you just cut around a favorite t-shirt? Yes, turn the tee inside out and lay it down flat on your parchment paper. Draw around it the best you can and then cut out the paper along your drawn lines (adjusting and smoothing as needed). Then use that as the pattern piece to cut your actual fabric! Where do you like to shop for fabric? I wrote a post all about that right here! I really love this dress that you made! 🙂 I recently bought a tee dress at JC Penny, looked really cute on the hanger but I didn’t realize it was see through, I can’t wear it except for maybe the beach or a pool party. 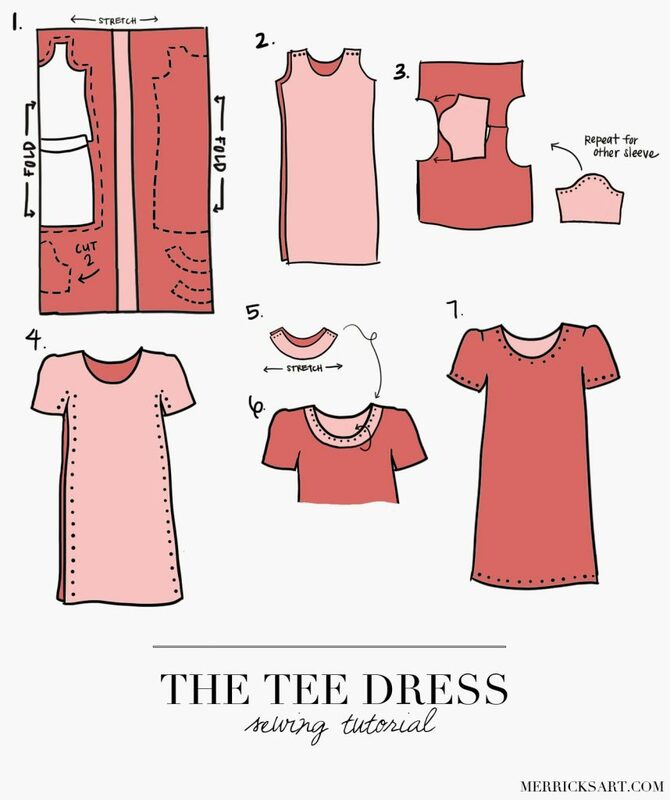 Anyway, I don’t own a sewing machine, sewing is one skill set that I just don’t have, I’d love to find a red tee dress like yours. How much would charge to make me a dress like yours??? Hi Cheri! So sorry to hear about the dress you bought that didn’t work out. I hate that. Unfortunately I’m not doing any commissioned sewing right now — I just don’t have the time. Thanks for understanding! Hi Merrick, I am getting ready to order the boots above from Nordstrom, but I’m torn over what size to order. The reviews are mixed between people saying they run big or are true to size…which did you find to be the case? Hi, This might be a silly question… but I am just starting to learn how to sew, and I wondered: where does the 2nd sleeve come from? On the instructions I can only see that it will give you one. Does that make any sense? Hey Kallie! If you look at the illustration, in step #1, you’ll see where you’re supposed to cut the sleeve down at the bottom of the fabric (on the fold). It has an arrow that says “cut 2” next to it. So you’ll need enough fabric to fit two of those sleeves on the folded edge (the illustration is just a representation…not EXACTLY how you’re supposed to lay out and cut your pieces). Hope that helps! What kind of sewing machine do you use? If you don’t mind me asking. 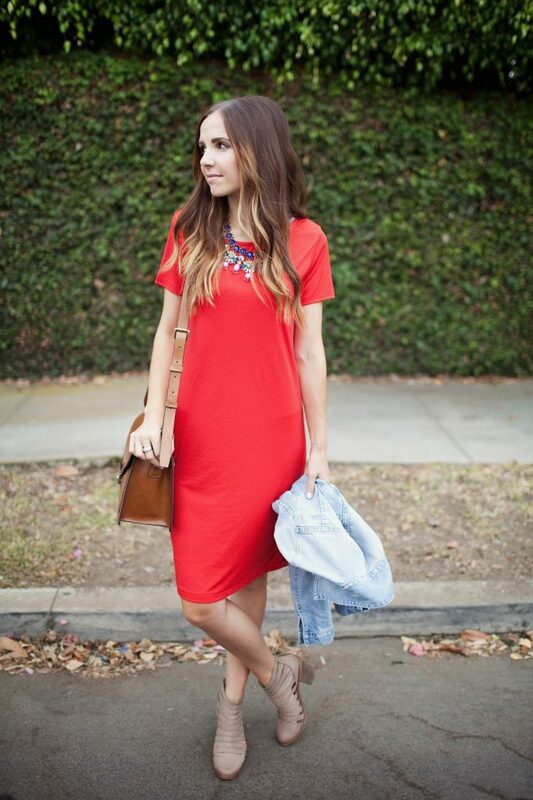 K what’s the difference between a tee dress like this, and a shift dress? How do you make the sleeve pattern?